L. Borer, E. Larsen, "Chemistry with a Peel," Science Teacher, 1997, 64, 5, 22. L. Borer, H. Erdman, "Synthesis of Trans-tetraamminedichlorocobalt (III) Chloride," Inorg. Chem., 1997, 31, 270. 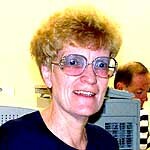 L. Borer, E. Barry, D. Nguyen, "Catalytic Chemistry," Science Teacher, 1996, 63, 8, 20. H. Hope, L. Borer, "5,5'-(2-hydroxy-1,3-propandiyldiamino)bis(1-phenyl-1,3-hexanedionato-o,o')oxovanadium (IV)," Acta Cryst. Sec C. Comm., 1996, 54, 7 1621. Preparation of copper and nickel complexes as models for enzymes. Adapting experiments for use in elementary and high school science classrooms.